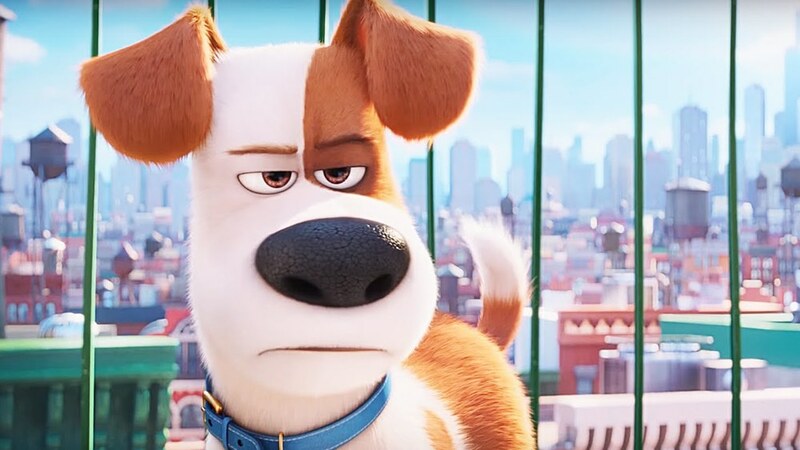 Patrick: In the advanced screening of The Secret Life of Pets, the crowd around us consisted of mostly adults—probably pet owners and lovers of animated films that walk that fine line of being entertaining for kids while actually serving as something adults want to watch. Jennifer: The advanced screening also started at 9:45 pm, so that probably accounted for the lack of kids. Patrick: When Pets wants to be, it’s incredibly entertaining for all ages as it delivers touching moments with the clever concept: “Have you ever wondered what your pets are doing while you’re not home?” Unfortunately, too often the film panders to its audience with jokes of the lowest common denominator and concepts that are tired and boring. Jennifer: Note to cat lovers: the movie was clearly made by dog people. The majority of cats in the movie are painted as gluttonous, disinterested, and often downright evil. Patrick: The hook of the film is that each “pet” is incredibly cute with over-the-top personalities. Unfortunately, it’s not a big enough hook to make up for the plot. The film is a headache-inducing madness where the “humor” lies in animals doing things that are wildly different than we’ve come to expect from usual animal behavior: a dog knows Kung Fu, a pig drives a cab, and a cute rabbit has a murderous streak. Even if none of it makes sense, it’s all thrown against the wall as if the film is afraid to slow down for a minute, lest its quirkiness fade away. Jennifer: I’m tired of seeing cute animals with psychopathic tendencies. I just saw it in Zootopia, and that was a superior movie. We get it: appearances can be deceiving. Patrick: When all is said and done, the film doesn’t actually say anything deeper than “pets are cute”. On more than one occasion, it touches on topics such as animal neglect, abandonment, and abuse, but it never explores the consequences or even really acknowledges those sad truths. Instead, they’re used more as a plot device. Instead of addressing the topics and taking a moment to enlighten or teach people, the film only mentions them in order to answer the question: “How did all these animals get here?” as briefly as possible so that it can return to its madcap action. Jennifer: Patrick doesn’t agree, in fact he loves the scene, but I found one sequence disturbing in light of the issues of animal rights that this film (seemingly unintentionally) raises. I think it’s strange that a film that is banking on its ability to anthropomorphize animals into a big payday includes a scene that is the aftermath of fairly horrific animal treatment. Patrick: It’s a fun scene though, quite possibly the most original one of the whole movie. And don’t get me wrong. I don’t need the film to preach, but is it too much to ask that be more important than it has to be? Any good work of art, even the dumbest of comedies, speaks to the human (or animal) condition in some fashion. The fact that Pets does not makes for a lazier, more ignorant, film. Jennifer: Seriously though, that scene is barbaric. Patrick: There’s also the matter of the main plot in the film: characters become separated from home, must find their way back, and in the process learn some life lessons. It’s an incredibly boring premise that I’ve seen a billion times. It’s unfortunate because the movie is most interesting when it shows pets in their natural habitats during the day without their owners. That’s the movie I really wanted to see. Patrick: There are worse things to see this summer. The film will please kids and entertain parents to a degree. There are laughs to be had, but there’s a reason people hold Pixar in such high regard. This is second rate to almost anything Pixar has ever made. Jennifer: Just watch Zootopia again. Seriously though, I liked it well enough. There were definitely some funny parts. If you have a kid or a husband who insists on seeing it, you won’t be miserable. It’s just unlikely this will be one you want to watch again (unlike Zootopia, which was awesome). Zootopia was 10x better than Secret life of pets. It came with a lesson of anti-racism, anti-discrimination, and maybe even resulted in a interacial relationship! It was entertaining, comical and although it’s not necessary that all children’s movies must illustrate a lesson, I feel it is very important especially because of the plasticity of children’s brains. S.L.O.P. oh my is that what it abbreviated as? Well it was a sloppy movie, there was no real plot, and we didnt get to see much of their secret life because most of the movie focused on the animals that were pets at one point but not anymore.